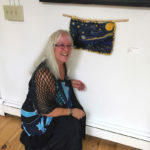 Peterson’s exhibit – on the walls of the Pemaquid Watershed Association office-gallery in Damariscotta through Friday, Jan. 18 – encompasses what one could deem the full range of possibilities when it comes to creating with wool and other fibers, from skillfully made craft to finely created art. 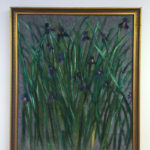 “Blue Flags,” on the wall of the PWA’s conference room, is a large framed piece depicting what appear to be Dutch irises growing outdoors, made with silk and wool. “Seguin, A Little Closer” is a lovely small landscape “painted” with wool, featuring trees, a river, and a distant lighthouse. “A Study of Stan Leiberman” pictures an empty rowboat beached in shallow water. 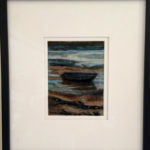 What makes this piece even more remarkable than Peterson’s other stunning landscape pieces is the reflection of the boat in the water that she has captured – in wool! Ditto for the light Peterson captures in her wool piece called “Rising Moon.” Peterson’s ability to make wool fiber behave like paint is nothing short of amazing. “Rusty-Patched Bumble Bee,” part of Peterson’s Endangered Species Collection, is a framed wool close-up of a bee, which is so impressive in its realism and detail that this reviewer simply wrote a large “Wow!” in her notes. PWA’s so-called “middle room” houses a large framed piece called “Spirit Conflict,” featuring swirls of dyed wool fiber in a number of colors. 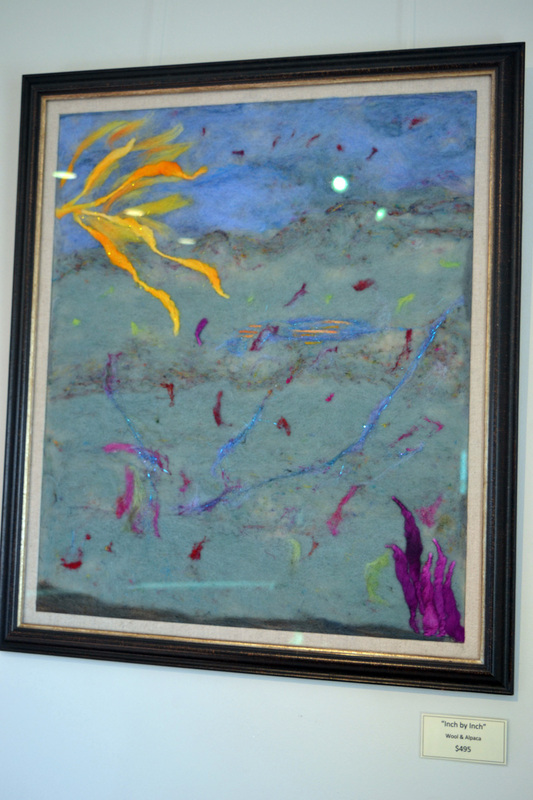 On a background of black felt, Peterson has created a depiction of what one might experience in the midst of a dream or a psychological struggle. 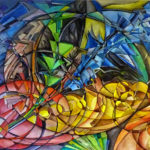 Amorphous shapes inhabit space alongside what looks something like a yellowish squid and a full moon – just the type of symbolism one might expect to see in such a situation. Also in the middle room and along similar lines is “Faerie Trails,” made of wool and nylon sparkle. “Faerie Trails” offers the viewer a calmer feel than “Spirit Conflict” – more dreamy and without the implied turmoil. 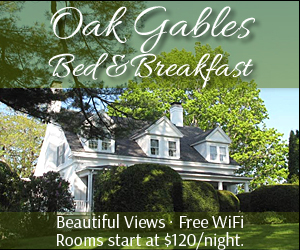 Other highlights in the middle room include a piece called “Free,” an impressive work depicting a horse with a full mane and tail in black wool against a beige background. Unlike any other piece in the “Woolscapes” show, “Free” looks very much like a Chinese pen-and-ink drawing. Peterson’s take on Vincent van Gogh’s iconic painting “The Starry Night” is also very nicely done. Fashioned from wool, it is unframed and hangs from a stick – a “beaver stick,” as Peterson terms it. PWA’s middle room is also where Peterson’s craft items are, such as her “Hugs,” which are knitted from various fibers, such as alpaca, merino, cashmere, nylon, Angora, and silk, and an assortment of fingerless mittens, hand-spun and hand-knit “glamour cuffs,” and little dollhouse rugs. This is where one gets the opportunity to physically feel the warmth and the softness of Peterson’s work – a particularly nice touch during this chilly time of year. 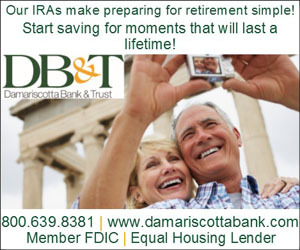 The PWA office-gallery is located at 584 Main St., Damariscotta. 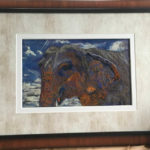 The “Woolscapes” exhibit can be viewed during office hours, weekdays from 9:30 a.m. to 4:30 p.m.
Peterson is donating 35 percent of the proceeds from sales of her art at this show to PWA. Her “Hugs” shoulder wraps are currently on Christmas special for 25 percent off. 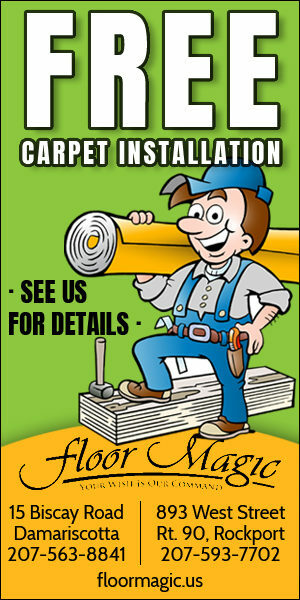 Call 563-2196 for more information.